In mid-January, I found myself calling upon rusty rock climbing skills to scramble up a steep side canyon of Peru’s Rimac River valley. I was with a group of engineers and local municipal officials on the way to assess disaster reduction infrastructure that had been installed in early 2016 against the threat of a strong El Niño-enhanced rainy season. 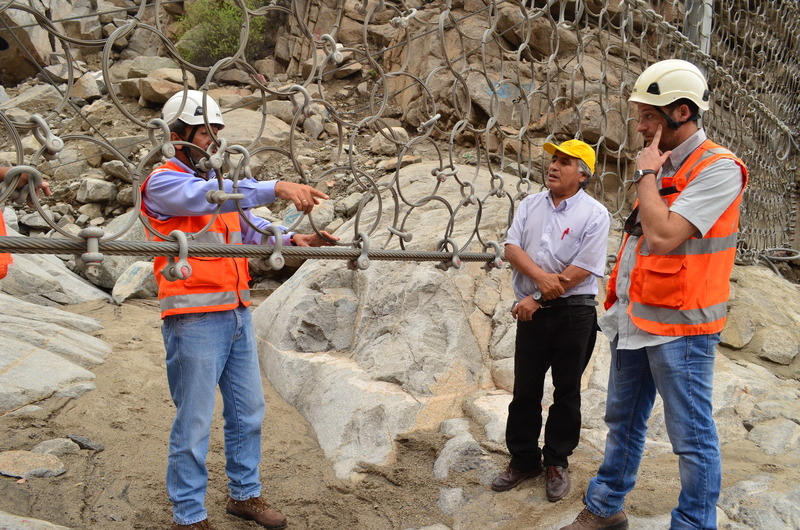 The Swiss-made barriers we were going to see, which resembled giant steel spider webs stretched across the streambeds, had been constructed in multiple locations in the Rimac watershed to reduce the destructive impacts of the region’s recurrent but unpredictable huaicos—powerful debris flows that form when precipitation runoff mixes with loose rock and other material on unstable slopes. The 2015-16 El Niño did not live up to its forecasted intensity in Peru, and the barriers went untested until heavy rains in early 2017 unleashed a series of huaicos on the Rimac valley, damaging homes and flooding roadways. Where the barriers were installed, however, no major impacts had been reported, and we were eager to see if the infrastructure had made a difference. Most of the time, the Rimac valley looks more like a lunar landscape than a flood-risk hotspot. Yet with only a few millimeters of rain in the surrounding highlands, this arid region becomes extremely vulnerable to huaicos. Located between the sprawling cityscape of Lima—the planet’s second largest desert city—and the lush foothills of the central Andes, the middle reaches of the Rimac watershed have been settled rapidly over recent decades, often without effective zoning regulations to restrict occupation in even the most hazard-prone areas. I had not planned to work in the Rimac basin when I moved to Austria to take up a postdoctoral position in late 2015. While my research includes the study of climate change-related risk in Peru’s Cordillera Blanca (the world’s most extensively glaciated tropical mountain range), I came to IIASA to focus on watershed-level governance and the implementation of the Integrated Water Resource Management (IWRM) paradigm. Yet as a Spanish speaker with extensive experience in Peru, I was well suited to get involved in IIASA’s activities in the Rimac valley as part of the Zurich Flood Resilience Alliance Project. This project, which includes close collaboration with the NGO Practical Action in Peru and Nepal, supports measures to understand and address the underlying drivers of flood risk and to move beyond short-term disaster preparedness and response towards transformative actions that build long-term capacity and resilience. As part of IIASA’s Flood Resilience team, my work in the Rimac valley has included activities ranging from evaluating El Niño preparations to conducting interviews with public authorities and local residents living in the Rimac basin. This fieldwork is just part of our project’s efforts to identify the systemic components of flood risk and vulnerability in the region and to promote productive exchanges between residents, policymakers, and the scientific community through participatory research and innovative approaches such as serious gaming. 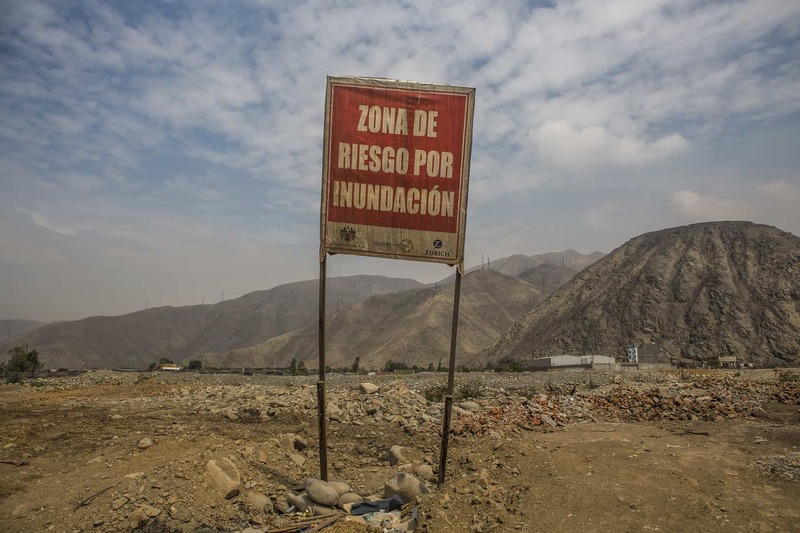 “Flood Risk Zone,” Ate, Peru. ©Soluciones Prácticas. Click for more photos. In addition to building expertise in a new setting, my involvement in this work has helped me better incorporate risk-focused systems thinking into my broader research agenda—a perspective that is too often overlooked in integrated resource planning. An example of how my research interests are converging within this project is through the promotion of a risk-management working group to advise the multi-sectorial watershed council in charge of IWRM planning in the Rimac valley. The establishment of this working group and the participation of project partners at Practical Action in its activities should mark an important step in bringing lessons from the Flood Resilience project regarding links between disaster risk reduction, economic development, and community resilience to bear on watershed planning in the Rimac basin. More broadly, we hope these insights will influence policy making in other settings in Peru and beyond that face similar challenges in handling risk management and economic development as intricately linked and co-dependent governance processes. Returning to our January field inspection, we found that one of the new barriers had been put to the test. The structure had captured several tons of debris, protecting a neighborhood that had been devastated by a huaico in 2015, and local authorities were already discussing the potential to build additional barriers to guard their community. While I celebrated this outcome with them, as I look to the future and the goals of the Flood Resilience Alliance, I am hopeful that such infrastructural interventions will be just one aspect of comprehensive plans for hazard reduction, with long-term risk management actions increasingly seen as a vital component of watershed-level planning and governance.